New flavor! Nut butter filled. USDA Organic. Certified Organic By QAI. Nothing beats a new adventure: New sights. New smells. New experiences. Back in 1986, my friend Jay and I bootstrapped a 16-day bike tour in the Alps and Dolomites, including the iconic Passo di Gavia in Italy. We took our time. Met new people. Ate great food. And rode until our legs burned. Since then, I've been back many times and, though the pass has evolved, it's still special to me. The same but somehow - different. 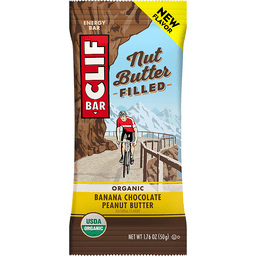 That's the inspiration for our new Clif Nut Butter Filled Energy Bar - the same Clif Bar kitchen -crafted goodness you know and love but filled with creamy nut butter. So, where will your next adventure take you? Gary. Founder and Owner of Clif Bar Company. Clif Bar Family Foundation. Certified Organic by QAI. Emerge Hydrated Hitting the pavement, crushing a kettlebell set, and flowing through your favorite yoga sequence will get your blood moving, heart pumping, and, of course, skin sweating.Sweating is critical to keeping your body temp regulated; but with each drop of perspiration, you're losing essential electrolytes and fluids! So, in order to stay hydrated, it’s important to keep your water bottle filled during and after your workout.Introducing NEW Emergen-C Hydration+–the smart way to fill your water bottle. With 75% lower sugar than the leading sports drink, every flavor features key electrolytes to replenish you, Vitamin C to fortify you, and as much potassium as a banana(7). Emergen-C Hydration+ is made with no artificial flavors or sweeteners, and is available in 3 delicious flavors: citrus-y Lemon-Lime Twist, flavorful Raspberry Splash, and tangy Orange Spritz with Glucosamine. Even more, we have verified that Emergen-C Hydration+ is gluten-free and made with ingredients that are not genetically engineered (non-GMO)(8).Emergen-C Hydration+ can be paired up with other Emergen-C products, so that you can support your daily wellness needs. (7) = Based on the USDA.gov nutrient database for a small, raw banana(8) = We’ve based our non-GMO standard on a careful evaluation of FDA guidance documents, existing and proposed standards from within and outside the US, and standards set by independent organizations. Each box contains 18, 0.33-ounce packets of Emergen-C Hydration+ Orange Spritz flavor with other natural flavors Emergen-C Hydration+ is made with key electrolytes to replenish you and Vitamin C to fortify you. The new product features as much potassium as a banana (7). 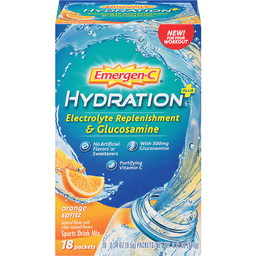 Emergen-C Hydration+ in Lemon-Lime Twist flavor has 75% lower sugar than the leading sports drink Each delicious packet of Emergen-C Hydration+ contains no artificial flavors or sweeteners, gluten free and non-GMO (8) ingredients.